Kevin Albuit, of Manchester, and his family couldn’t stand to see photos of animals struggling in the Gulf Oil spill. So, last Friday, Kevin’s daughter Nicole set up a Facebook page, asking for supplies to help the animals. They have already gotten donations, but not just locally. “We've had people from South Africa that are willing to send stuff to us, Canada, Maine, California,” Albuit said. 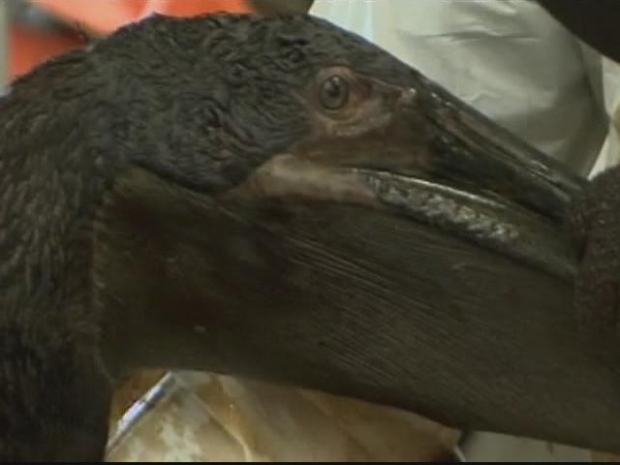 A Manchester family is hopping on Facebook to help collect items to help keep birds in the gulf alive. People are donating simple things like toothbrushes, Q-tips, Pepto Bismol, which is used to help the bird’s stomachs, and Dawn liquid soap. The father-daughter duo are working out of their family flooring company, Flooring Solutions & More in Manchester. Another local business has also helped promote the Albuit’s fight by donating signs to post in the area. The Albuits plan to drive the donations to the Gulf at the end of July. If you are wondering why they’re taking on this giant task, Nicole has a simple answer. “I'm an animal lover. These animals, they can't fight for themselves, so we have to fight for them,” she said. They are also looking for sheets, towels, cardboard boxes, Duct tape, aluminum foil and more. You can get to their Facebook page here.